A protective mask on a sculpture keeps up the shop’s sense of humor. When a gust of wind and a flimsy event tent a few months back accomplished what 160 years of corrosion, nor’easters, and clumsy tourists couldn’t — knocking the famed Benjamin Franklin statue to the ground — Sean McDonnell knew precisely what to do. Josh Craine is no stranger to Boston landmarks. 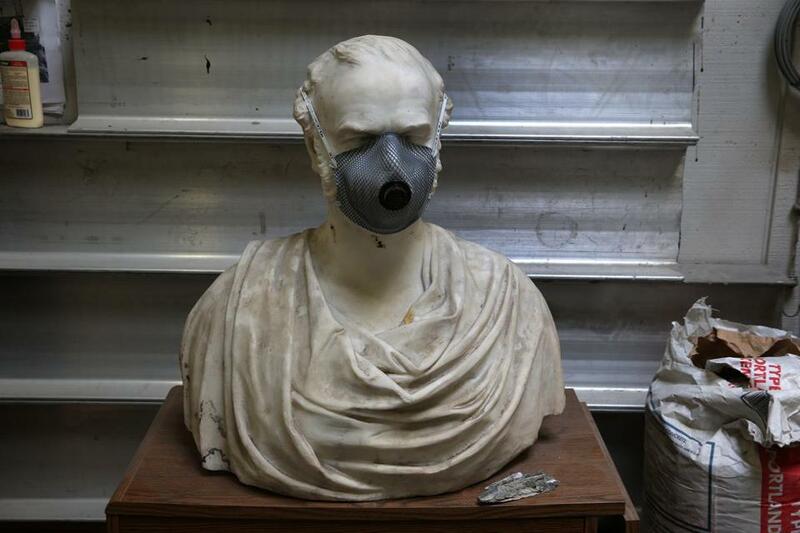 As the owner of Daedalus Inc., a local monument, sculpture, and fine arts conservation firm, Craine has reconstructed faces, rebuilt fountains, and reattached heads. But speaking to McDonnell that Monday in May, Craine felt disbelief set in: An 8½-foot-tall statue that had lorded over the Old City Hall courtyard, a statue so old it outdated the building itself, had just fallen? There he was, though, on School Street not 30 minutes later, surveying the damage for himself. If you were a passerby that day, you would have been excused for mistaking it for a grisly crime scene. The courtyard was cordoned off from the public. The concrete where the statue’s head landed was cratered. And the statue itself had been covered in black plastic wrapping that had the look of a body bag. Appraising it, Craine was surprised by the lack of obvious damage; despite falling from a roughly 10-foot-tall pedestal, the statue — weighing somewhere in the neighborhood of a ton — was still in one piece. Its true condition, however, wouldn’t be known until he got it back to his Watertown workshop and conducted a proper examination. Designed by Richard Saltonstall Greenough and installed in 1856, the Franklin statue holds the distinction of being the first bronze statue commissioned by the city. What’s more, it has earned a reputation over time as one of the city’s most notable works of public art, its prominence bolstered by its location on the Freedom Trail, which attracts more than 4 million visitors annually, according to the Freedom Trail Foundation. The statue blew over during heavy winds back in May. If anyone was capable of nursing the piece back to health, though, it was Craine. His father, Clifford, cofounded the company that would become Daedalus in 1983 following years as a conservator with Harvard’s Fogg Museum. The younger Craine joined his father in the 1990s, quickly earning a reputation as one of the region’s top conservators. 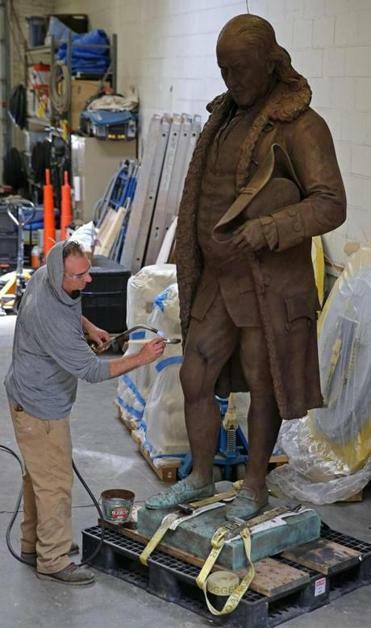 In the years since, he’s worked on the Brewer Fountain and the Shaw Memorial, both on Boston Common, and the Capitol building in Washington, D.C.
As Craine embarked upon his newest project, however, a funny thing happened: He couldn’t seem to find anything significantly wrong with old Ben Franklin. No matter how hard he searched, no matter how closely he examined — “I’ve spent way more time than I should have staring at this thing,” he says — he couldn’t find structural damage. No chipped elbows. No cracked arms. Franklin’s balding head, which appeared to bear the brunt of the fall, was still reassuringly attached. In fact, aside from a few small scratches and a minor chip in the corner of the statue’s base, there was almost no evidence that the piece had endured any kind of trauma. 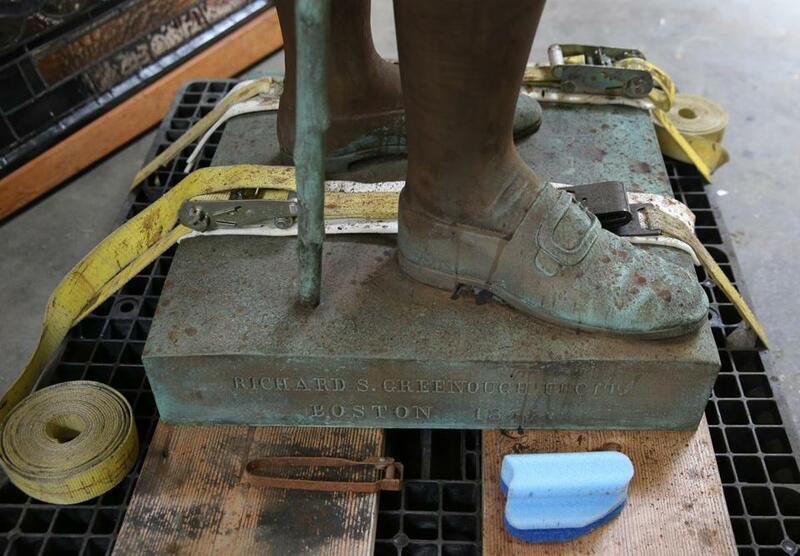 In his workshop recently, Craine walked a visitor through the steps necessary to return the statue to form: applying a patina solution, which restores the piece to its original color, as well as an acrylic coating and a light paste wax for protection. The biggest addition will be an internal fastening system at the statue’s base to hold it in place, preventing another tumble. The rehabilitation process isn’t complete: Craine is also filling in some small imperfections, or “losses,” that have developed in the body of the statue over time. The plan is to have the piece re-installed between Aug. 29 and Sept. 2, with a small ceremony Sept. 8. Until then, visitors making the pilgrimage to Old City Hall for a glimpse at Franklin will be left to rely upon their imaginations. On a recent afternoon, Ron Thorne and his family were at the site. Visiting from Green, Ohio, they’d been told by a friend to make sure they paid the Ben Franklin statue a visit. They’d walked two or three miles just to see it, and when they’d arrived, the group could only stare at an empty pedestal.